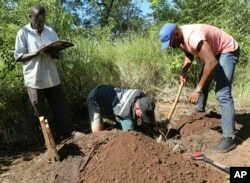 Farmers, state officials and observers have expressed mixed reactions over the Zimbabwean government’s announcement this week that it will compensate about 4,500 white farmers whose land was forcibly grabbed and redistributed to almost 300,000 indigenous blacks in an attempt to redress what it called imbalances of the colonial era. This followed years of debate over whether or not to compensate the farmers who lost productive land under the agrarian reforms, which started in 2000. The issue of compensation has been a controversial issue in Zimbabwe, with some believing that the farmers should not be compensated since many did not pay for the land in the first place, arguing that they too forcibly took over the land from the indigenous blacks. “It’s non-implementation of it does not mean to say they are no longer entitled to compensation, because it’s something that is already in the law of the land,” said Jokonya. “So now what is being done is a question of executing what is in the law. So there is nothing one can send back. It’s already agreed to. Whether it’s fair or unfair, it’s immaterial, because it’s in the constitution,” he added. In its 2019 budget, the government allocated $53 million in its local Real Time Gross Settlement or RTGS currency - which, at the current exchange rate of RTGS$1 to US$3,0675, is equivalent to about US$17 million. Some of the 4,000 white farmers affected by the land grabs, have embraced government’s efforts as a first step in showing goodwill, but say the amount is a pittance to what the government should be paying, which some farmers have placed as high as S$10 billion. Zimbabwe’s Permanent Secretary of Information, Nick Mangwana, says the government’s allocation is based on compensation for improvements to the land, not the land itself. “Our constitution and law is very clear that what government is compensating for are the improvements, and developments that were on the farm, not for the land itself,” Mangwana said. Zimbabweans paying reverse reparations to Rhodesian farmers? But Associate Professor of African History at the University of California, Santa Barbara, Mhoze Chikowore like firebrand South African opposition leader Julius Malema is not buying the government argument. Chikowore says, "Our government’s repeated stance that we are paying only for “improvements” and not the land itself does not make sense, either." He adds, "What are improvements on stolen property that the thieves proceeded to extensively exploit for over 120 years, utilizing chibharo (raped labour) to grow commercial crops using destructive pesticides and fertilizers that have polluted underground and overland water sources, vegetation, animal life, and denuded the soil? Is such undeserved gain not a debt to the generations of owners of the land that the Rhodesian farmers must pay, not the other way round? … And we have to pay them reverse reparations for cannibalizing us thus? In 2000, Zimbabwe took the bold stance to actually decolonize our economy and it became a model that South Africa, Namibia and the other countries still strangled by the legacy of settler colonialism are following. What are we telling them now with this cowardly move? That it is OK to foreground the humanity of colonists and enslavers over their victims--from Haiti to West African (former) French colonies and now in Zimbabwe?" While the initial smaller allocation of compensation may appease some of the farmers who lost everything following the forced removals and are willing to settle, some white farmers who claim they lost billions, are promising to push harder for larger compensation. Among them is former commercial farmer and human rights activist, Ben Freeth, who applauded the government’s efforts, as “a small step in the right direction,” but said the allocated amount of US$17 million doesn’t come close to what the government knows it will have to pay. Freeth cited the case of German national Bernard von Pezold and eight of his family members who successfully sued Zimbabwe in 2015 and were awarded close to U$200 million, by the Washington-based International Center for Settlement of Investment Disputes (ICSID), which in addition ordered Zimbabwe to also return the land titles to von Pezold. “When they took his properties, he went to international arbitration and in Washington DC he got an international arbitration award, where the Zimbabwe government put in its case and he put his case, for around US$200 million. So this $53 million RTGS will take about 10 years, if that is the amount they are going to put forward each year, it will take about 10 years just to pay off that one German national,” explained Freeth. Another white farmer and former legislator for the opposition Movement for Democratic Change, Ian Kay, said the government’s biggest challenge will be to establish what to pay farmers, given the lapse in time. “I think it’s very ambitious for the government to say it’s going to evaluate the farms, and that number, the number of farms we are talking about for that number of farms and to do it two decades later nearly, it is going to be a very difficult task to perform and I would think it’s not possible, to tell you the truth,” said Kay. While admitting that the initial compensation might be too little, finance minister Professor Mthuli Ncube assured the farmers that government and farmers are still assessing the amount to be paid for improvements made on the farms. Kay says the compensation process might be complicated by Zimbabwe’s unstable currency but he says he had made his own evaluation. “We had professional evaluators do the task, as did many farmers at the time. So we do have that evaluation in place, and it was done both in the currency of the time and hard currency, so that has been done. So whatever is done subsequently, it will be difficult for them to do it now, like I said, 20 years later, but when the evaluations were done the farm was productive so it’s a real value of what we left behind,” Kay said. Concurring with Kay, CFU president Ben Gilpen, said most farmers evaluated the worth of their farms, and know their worth. Further, argued Gilpen, while government is only prepared to pay for improvements on the farms, some farmers actually bought their farms and wanted that factored into the overall compensation. “The constitution provides for payment for improvements, it doesn’t cover land, but our farms were purchased basically land and improvements, we are yet to find a way forward. We are not looking for consequential payment which would make the bill much much higher, but I guess US$9 and a half billion is what the composite figure for land and improvement has been done by professional evaluators on our side,” said Gilpen. In trying to accommodate the government’s challenges in coming up with enough money to compensate all the farmers, Freeth, whose father-in-law died from injuries sustained during a take-over of their farm in 2008, are proposing that Harare consider resettling farmers on farms that are being underutilized in lieu of the compensation. “Our view really is that many of these farms are lying idle at this point and time, there are still a lot of skills in Zimbabwe that could be utilized to get those farms up and running again. Why not do a restitution program where some farmers who want to come back … Let them go back when their farms are not being used at the moment,” said Freeth. Former finance minister and opposition MDC legislator, Tendai Biti supported the proposal, and argued it could save the government from spending what it does not have. “Our land is derelict, it’s not being used by the new farmers, 20 years after the land reform program. And to be honest, right now we can’t feed ourselves. We used to be the breadbasket of the region, now we are the basket case of the region, so allowing some farmers to get land as compensation, is very good because it will increase productivity apart from lessening burden of compensation,” Biti said. Editor of the private weekly Zimbabwe Independent newspaper, Dumisani Muleya, said though paying the white farmers is a controversial and divisive issue among Zimbabweans, if done correctly, it could help normalize ties with the West and ultimately revive the economy. “They have to do it, if they are interested in resolving these problems fundamentally. Because not doing it, you will be continued to be viewed by those, particularly the western countries, that you need to do business with, that you need to restore relations with, you need to trade with, you will continue to be viewed as a state that is founded on the pillars of lawlessness, so you can’t afford that,” said Muleya. Muleya urged Harare to appeal to the international community for funds to settle the huge farmers’ debt. “Zimbabwe needs to have a conversation with interested parties. United States in this case, obviously in view of the ZIDERA (Zimbabwe Democracy and Economic Recovery Act) laws, Britain in particular, and some European Union states who have farmers in Zimbabwe whose land was seized, and we still have farmers in Zimbabwe at the moment. And if you recall, in 1987, sometime in May, the United Nations Development Program, wanted to fund the land reform program, as long as it was done in an orderly and systematic manner. So those are some of the possible sources of funding that the Zimbabwean government can explore,” said Muleya. “We know that they’ve been approaching international lenders, international financial institutions, and I’m sure if they come up with a package that is attractive and proves the ability to repay, they will be able to source that money to finance this,” said Gilpen. With plans to proceed with the compensation of white Zimbabwe farmers well underway, former finance minister and current chair of the parliamentary oversight committee on public finance, Tendai Biti said parliament should be involved in the process so as to ensure transparency. In the 2016/17 season, Zimbabwe launched a Cuba-style command agriculture scheme to subsidize newly-resettled black farmers, to reclaim its status as the regional bread basket. But despite pouring billions of dollars into the program, the United Nations estimated that about 5,3 million Zimbabweans are food insecure. Finance minister Ncube has indicated a willingness to scale back on the program that the opposition alleged had been abused by senior government officials. According to treasury data, expenditure on agriculture has been one of the major components driving the southern African country’s unsustainable budget deficit. Expenditure on the agriculture sector reached US$1,1 billion as of August 2018, against an annual budget target of US$401 million. Of this, US$238 million went towards command agriculture, US$263 million towards vulnerable input support scheme and US$505 million to grain procurement. At a recent press briefing in Harare, Minister Ncube said they plan to tap the private sector to ease the burden on the government. “There is no question that it (command agriculture) has improved the food security situation in Zimbabwe. It has been a success, but what we are saying is that there are players that have been missing in the financing of command agriculture. It is the private sector banks who should begin to fund command agriculture,” Ncube said. According to agricultural experts, at independence in 1980, white farmers owned more than 70% of the most fertile land in Zimbabwe, which caused friction with the majority blacks who constituted almost 80% of the population.